What wellness design subject would you like me to write about in my next book? a) The Treatment Room Cure – How to design exam and treatment rooms that make your patients feel nurtured and safe. When the votes came in, I didn’t expect the outcome to be as close as the latest presidential election. A and B were almost tied but A came out a bit ahead. In my mind, A, B and C are all Hillary and none of them Donald. I’ve already started writing The Treatment Room Cure and I’m loving every minute. In my new book, I pour my heart and soul into sharing what I’ve learned in the past fourteen years of designing treatment and exam rooms, and how to do-it-yourself. 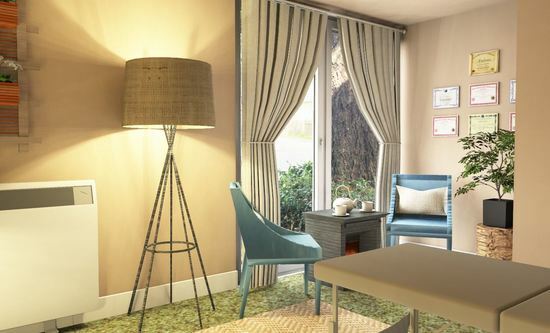 You’ll be flooded with dozens of beautiful illustrations and pics of various exam and treatment rooms laid out in a variety of ways to achieve the best possible design specific to your needs. As a thank you for your vote, (and only if you are on my list — sign up here) I offered two free custom virtual design renderings for a small treatment or exam room to be included in my book. I asked my tribe if you or someone you knew had a treatment or exam room in need of some redesign love, to please let me know. The winners only needed to email me a simple hand drawn floor plan of the room with the dimensions of windows, doors and walls. As long as I have all the correct dimensions, the drawing itself can look like your five year old drew it. In return, the winners received a computer 3-D artistic rendering of their treatment or exam room with new colors and furniture laid out in the space. These two free designs were awarded to the first two people who responded to my email. Don’t worry if you missed this opportunity. Make sure you sign up to my list and you’ll be among the first to know about my future offers.